Your Next Stamp's Friday challenge is here and the sketch is perfect for a few things. I thought how perfect it would be to make a shaker card or even to make a fun window/spinner card. Any way you choose to use the sketch will give you multiple ideas. I decided to use the sketch to create this card using One in a Melon. 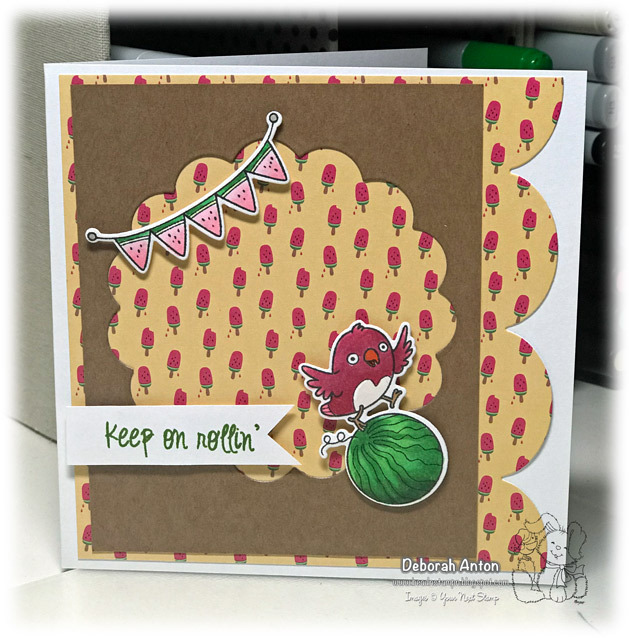 I created the window using the YNS scallop circle dies and used the Watermelon Party paper pack for the background. The images were stamped and cut out using the coordinating dies before being popped up over the window. We hope you will join the challenge and link your creation up on the YNS challenge blog for a chance to win! Thanks for stopping by and hope you have a great weekend!